House GOP Leaders Blindsided By Patriot Act Defeat : It's All Politics House GOP leaders had their worst loss since taking over the chamber last month with the failure of lawmakers to pass an extension of parts of the Patriot Act. Some Tea Party lawmakers joined other Republicans and many Democrats to oppose the extension. 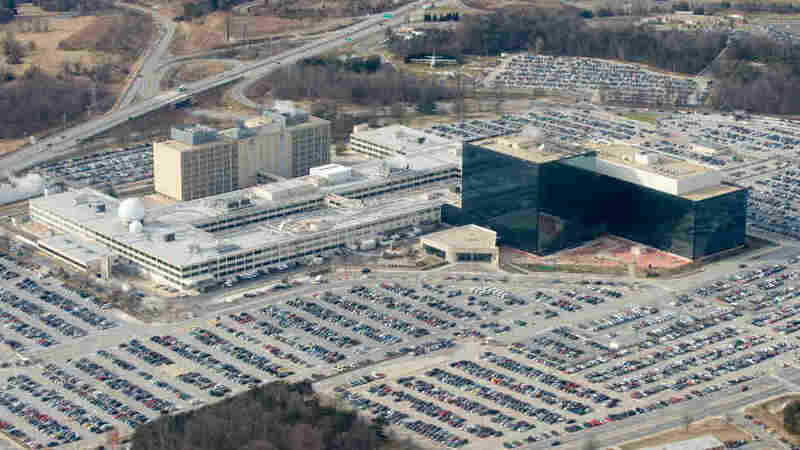 National Security Agency (NSA) headquarters at Fort Meade, Maryland, January 2010. If the House's new Republican leaders were going to fail to pass any particular piece of legislation, you wouldn't expect it to be an extension of several Patriot Act provisions. The Patriot Act, a Bush Administration legacy, has typically been more strongly supported by Republicans than Democrats. But the House leadership was blindsided Tuesday evening when a Patriot Act extension was defeated. Several new GOP lawmakers from the Tea Party wing who, in principle, are suspicious of federal power, joined other Republicans as well as House Democrats to torpedo the extension. The legislation failed on a 277-148 vote, coming seven votes shy of the two-thirds margin needed to pass bills under House rules normally reserved for non-controversial legislation. It was the biggest defeat for the House's new GOP managers since they took charge last month. House Republicans vow to bring the bill up again under chamber rules that would require just a simple majority. The Obama Administration supports the extension. The FBI's authority to conduct some kinds of surveillance and get business records expires at the end of February. So the defeat of a House plan to extend the deadline until the end of the year threatens to throw the law enforcement community into disarray. A GOP aide blamed the situation on new lawmakers who don't understand the Patriot Act and on Tea Party favorites who reject broad federal powers. The Senate will try to push forward its version of the plan next week. Now the question is whether Republicans in the House can work with Democrats in the Senate with only two weeks of room to maneuver. Aides to Republican leaders also blamed Democrats who had voted for such an extension during the last Congress but didn't this time. They also blamed House Majority Whip Kevin McCarthy (R-CA) whose job it is to count the votes before the actual vote and twist enough arms to gain passage. "I am surprised that so many Democrats who supported an extension of these very same provisions last Congress suddenly changed their votes," said House Judiciary Committee Chairman Lamar Smith, R-Texas. "President Obama supports a reauthorization of these important national security tools. And the House bill provides Congress with the opportunity to engage in a thorough review of the provisions as we consider a longer reauthorization. It's unfortunate that partisan politics seems to have prevented so many Democrats from doing what's best for America's national security." GOP aides, however, were pointing the finger at House Majority Whip Kevin McCarthy, R-Calif. Aides said McCarthy failed to whip the vote, which led to the embarrassment of the bill falling short and leaders being caught off guard. For Democrats, it was an opportunity for a little payback, to bloody the noses of the House's new GOP managers. But the vote also demonstrated the impact of the House losing so many of its more centrist Democrats. Some of those who were defeated in the mid-terms or retired would have likely provided the necessary votes to pass the extension. But they weren't there. Instead, the House Democrats who remain are more liberal. And they could hardly contain their joy at the House leadership's failure to pass the bill.